Every GaryTailor.com suit is individually handcut—an art we still value. The cut is made to your exact measurements and style. 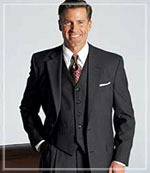 Linings and other portions of the suit are made with the highest quality materials. All the button holes are hand sewn with the finest silk threads—which is key to quality workmanship. If you would like, we can put real button holes on the sleeves, giving it a elegant custom look. All seams are reinforced for maximum durability. When each suit is cut by our master tailors, they keep paper cuttings based on your exact measurements for future orders. If your size remains the same, all you have to do is select the fabric and style. Please note prices do not include shipping and handling charges. Upon completion, each suit is carefully inspected by our master tailors to maintain quality workmanship.